Treat yourself to a delicious Italian-style chicken, basil and pesto salad. 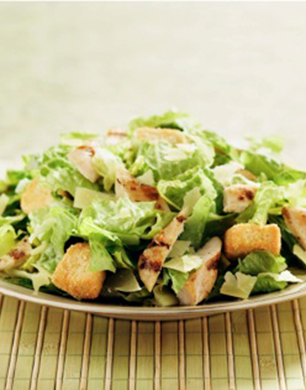 Filled with protein and proteins this gourmet salad is a tasty and healthy weekday meal option. Perfect if you are looking to get beach-body ready. In a small bowl, combine all dressing ingredients. Whisk until well blended. Refrigerate covered, until ready to use. Brush both sides of chicken breasts with olive oil and salt and pepper to taste. Grill until internal temperature of chicken reaches 165°F. Remove from grill and let stand for 10 minutes. Slice into 1/4-inch pieces. Mix greens, tomatoes, mozzarella and chicken with prepared dressing until well coated. Move to serving plate. Top salad with Fresh Gourmet® Basil Pesto Ciabatta Croutons. Why not try a smoothie for dessert?